As of August 13, enhancements to the sanctuary are in full swing! 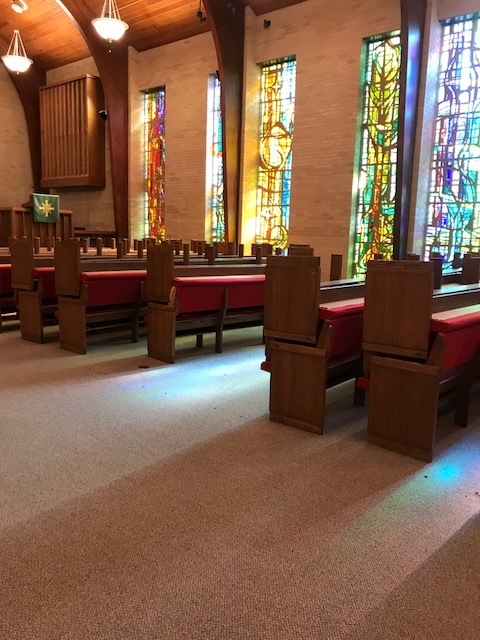 The 40-year-old carpet in the Narthex and Sanctuary has been replaced. Four pews have been shortened to allow room for wheelchair spaces within our seating area. Beginning on Monday, August 20, the pews are being re-upholstered. The work should be completed in early September. The workers are very busy during the weekdays, but Sunday services will not be impacted. A majority of the cost is being covered through the generous gifts received during the 50th Anniversary campaign, along with additional private donations. Additional gifts are appreciated and would have a lasting impact on this congregation. We thank Rick Kaiser for giving his expertise to coordinate this project. In addition, we are grateful to the Leisure World Wood Shop for volunteering their time to shorten the pews and construct new end caps. Stay tuned for more pictures as the work progresses! Wood Shop team volunteered their expertise to shorten pews. As of Wednesday, August 15, one side has new Carpet. As of Wednesday, August 15, the narthex is a work in progress! On Wednesday morning,, work is starting on the other side. 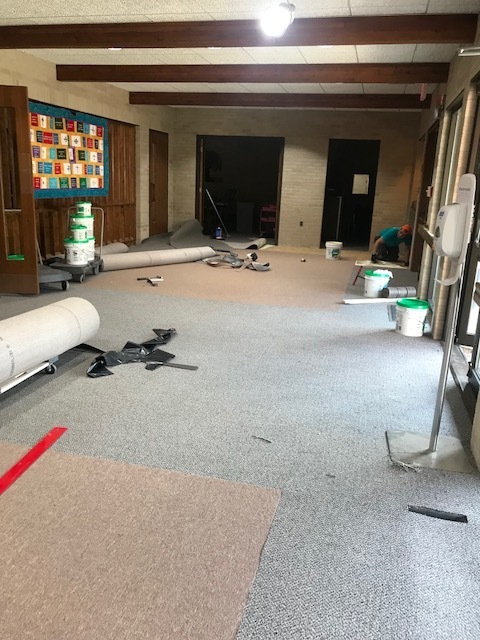 On thursday, August 16,, the narthex carpet is almost done. On thursday morning, carpet is being laid on the other side. ON Friday, August 17, The Carpet is done and the long job of putting pews back is almost done. On Monday, August 20 the front pews have been taken away for reupholstering. The Pew cushions will be back by Friday, August 24. Project Manager Rick Kaiser with Masoud Molayem of Floormax. 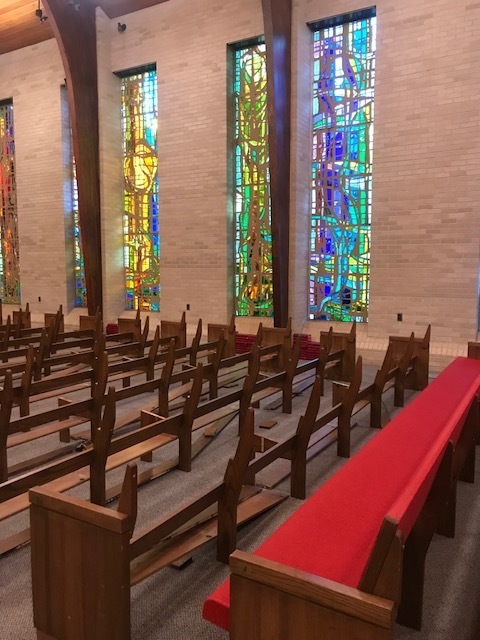 On FRiday, August 24, the front of the sanctuary has beige pews and the back is still red! All the pews will be done in a few weeks. The newly covered pews make the sanctuary seem brighter! Morning sunshine casts colorful lights on the carpet. The bright colors of the stained glass windows shine onto the carpet.